We are pleased to announce the next beta release of X1 Search 8.5 (Build 6001dp). This 8.5 beta (Build 6001dp) builds upon the first beta release, and includes the features and enhancements listed out immediately below. Please note the brand new flyout data source and settings menus which are a significant improvement to our UI. For a comprehensive list of all enhancements part of the 8.5 beta thus far, please see the bottom of this post. Please download soon and we look forward to your feedback. Thanks again to our community for your continued feedback strengthening version 8.5. The new Main Menu feature is broken. How do I now use Help to find my installed version? These are just the first two things I found. There may be more. As for the second problem, looks like the Options page has failed to resize properly to take over the whole window. Can you try to resize the window and see if it fixes it? We will try to reproduce it too. Can you try to resize the window and see if it fixes it? It will not resize or move. Export results works as expected. 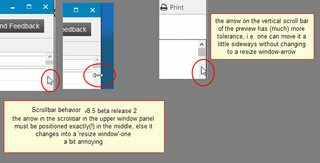 Again, "popup" Windows will not resize or move. All attempts to start and connect to X1ServiceHost failed. Same after rebooting my machine. I recently started getting this problem with last release of X1. I uninstalled and deleted all program folders and reinstalled to get the same errors. I then went through and uninstalled again, deleted all program folders, including the X1 directory under LOCAL in the c:\users\<username>\APPDATA directory. I also deleted all Registry hive keys. Rebooted, reinstalled, and voila! Don't ask me why, but it worked. I tried your hints (thanks a lot! ), but unfortunately without success. It is a real pitty, what X1 does here: they asked me for creating traces, I replied on short notice and that's all. Nothing. They even don't respond if you ask for the current state of your problem. Unfortunatly this behavior is the same when using it professionally: I reported several bugs, sent traces after being asked for them and that's it. I think I will continue without X1 Search for the future. Don't know, why they are releasing Betas if they do nothing with error reports. I have found an issue where if I select a PDF file in the search results, I get a little box saying "You have selected multiple items. You can use the buttons below to tag all items in your selection"
1) I haven't selected more than 1 item. PS: Also, when I do select multiple items, the buttons do nothing. Restarting X1 has fixed the issue I posted above. But it comes back on a semi-regular basis - I can't figure out what exactly triggers it though. I'm also finding it's doing its "Initial Indexing" quite often! The database is stored on C:, same as Windows etc (and where all the files being indexed are as well) so not sure what's going on here. I am having a problem with X1 needing to be restarted after having "lost connection." This most often occurs after resuming the computer from sleep. There is a related problem that is actually more annoying - when X1 restarts, it loses the column width settings. The default columns are so large that only two fit in the window to be seen. For the All Email tab, for example, I really don't need the column for "Size" to take up half my screen. So I wind up resetting the column widths over and over again. What about adding zoom and rotation to the preview toolbar ? where 1:1 equals actual pixels. top window panel: the mouse arrow must be positioned -exactly(! )- in the middle. With a very very minor movement to the right, the pointer changes into a window resize one. preview panel: the arrow can be moved much more to the side without changing, here it is okay. Don't know if this can be adjusted. Any plans to mark found text in PDF preview? I know it is an old request but nothing wrong repeating it. Trajan wrote: I am having a problem with X1 needing to be restarted after having "lost connection." This most often occurs after resuming the computer from sleep. There is a related problem that is actually more annoying - when X1 restarts, it loses the column width settings. The default columns are so large that only two fit in the window to be seen. For the All Email tab, for example, I really don't need the column for "Size" to take up half my screen. So I wind up resetting the column widths over and over again. Is there any solution for X1 continually needing to be restarted after having "lost connection"? It is frustrating. This release is expiring in a couple of days, on October 1st! Is there an updated version coming soon or do we all have to reinstall the last release version? RGlanzmann wrote: This release is expiring in a couple of days, on October 1st! I reckon that it would be a wise move to have a copy of the original installation to hand for the day when the latest beta blows up. It doesn't help that the beta expires at the weekend. Probably, we may have to do an uninstall first. I'll try it as an install first. But before I do that I will update the image of my system so that I can recover if the sky falls in. For safety's sake, I have just downloaded the installer stub for X1 8. Of course, it does not help that we can't download the full installation, a long-standing complaint about X1. We just have to hope that when the beta expires the on-line server will not have gone the way of support here and vanished off the face of the earth. You should see links to PREVIOUS VERSIONS that you have bought. We sincerely appreciate all of your patience and feedback throughout this extended beta period, which we will explain in a separate post in this thread. If you are visiting this forum due to an issue with Build 6001dp, please download 6001le at the link above and post all feedback there. Thanks again for your continued feedback and support, and we look forward to working with you to improve X1 Search 8.5. I note that the new version expires at the end of next January. It may be my imagination, but the new version seems to be a heck of a lot quicker.